After a joyous hip-hop party with Rae Sremmurd, ReachNow is bringing some late-night romance to Chengdu. HONNE are the soundtrack to our digital intimacies, our urban love lives in the 21st century. Their smooth electronic-soul a widescreen take on modern heartbreak and timeless heartache. 'Warm on a Cold Night.’ Good Together’. ‘Day One’. Their smash-hit singles have won them a massive global following, and their debut album was a captivating record that flirted with funk and shone in its quieter moments. They’ve just released an irresistibly infectious sophomore album, and theirs is a blissful, swooning live show perfected over the last half-decade. HONNE are making their Chengdu debut with ReachNow, and we can’t wait to share it all with you. HONNE are singer Andy and multi-instrumentalist James, who first bonded over their shared upbringing in South-West England; followed by the more evocative, US West Coast grooves of their record collections, and a mutual fascination with Japan. During a midnight re-watching of ‘Lost in Translation,’ it became apparent that this sense of a partner at a loose end - of wandering through a strange environment and struggling to convey what you mean - was just as relevant to their lives off-screen. When James found the word ‘Honne’ later on (本音, a Japanese phrase meaning ‘true feelings’), the boys knew it was theirs. The first song HONNE ever finished, 'Warm On A Cold Night', also served as the title for their stunning debut album. And, between the millions of stream and sell-out shows since then, the soulful duo have carved out an instantly-identifiable sound all of their own. For their next move, they focused on themselves. Placing a microscope to their own lives – the jet-setting highs and lows of being in a band, the relationships they tried to hold up back home – HONNE’s second album is a touching, personal record with its own universal appeal. Love Me / Love Me Notcemented their reputation as one of music’s most spellbinding propositions. Every peak, HONNE sing, means a challenge is round the corner; and equally: whenever life throws everything at once, better times are ahead. This is one of those.Warm on a cool spring night. 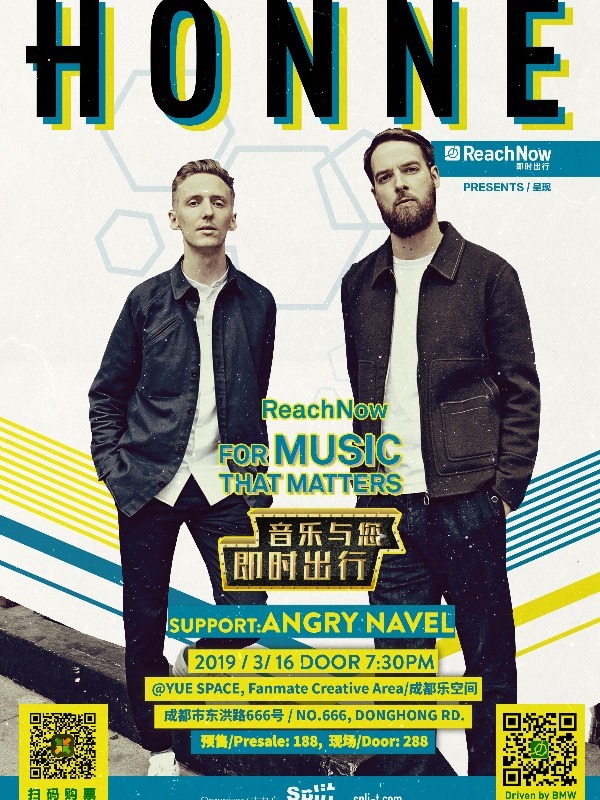 HONNE, first time in Chengdu, presented by ReachNow.